Where's Conor? Where Did Conor Go? He also has his own lively personality quite separate and apart from his autism. He is much more as a person than his autism. He is a lot of fun. While these pictures were being taken I was asking "Where's Conor?" "Where did Conor go?" (When my mouth wasn't covered). Conor enjoyed every second of our fun. And so did Dad. Vancouver, BC: - FEAT-BC [Families for Early Autism Treatment in BC] today announced it will be holding a “campaign kick-off rally” on Sunday, March 2, 2008, beginning at 2:00pm, at the Jack Shadbolt Centre for the Arts, 6450 Deer Lake Avenue, Burnaby. This rally launches the FEAT-BC goes coastal campaign, aimed at influencing the electoral outcome in more than a dozen targeted constituencies across Canada in the upcoming federal general election. The rally is intended to attract parents of autistic children and their supporters from across Metro Vancouver. Its aim is to ignite a grassroots campaign that will help elect candidates for Parliament who will support Medicare for Autism Now! “As a Canadian who does not have an autistic child, but who believes strongly in the fundamental values of this country, I am disgusted by the federal government’s willful indifference to the plight of these children and their families,” says Scott Hean, who will be master of ceremonies at the rally. For further information, contact: Jean Lewis at 604-925-4401 or 604-290-5737, and jean.lewis@telus.net. What distinguishes Asperger's Syndrome from autism is the severity of the symptoms and the absence of language delays. To the untrained observer, a child with Asperger's may seem just like a normal child behaving differently. They may be socially awkward, not understanding of conventional social rules, or show a lack of empathy. They may make limited eye contact, seem to be unengaged in a conversation, and not understand the use of gestures. One of the major differences between Asperger's Syndrome and autism is that, by definition, there is no speech delay in Asperger's. In fact, children with Asperger's frequently have good language skills; they simply use language in different ways. Speech patterns may be unusual, lack inflection, or have a rhythmic nature or it may be formal, but too loud or high pitched. Children with Asperger's may not understand the subtleties of language, such as irony and humor, or they may not recognize the give-and-take nature of a conversation. Another distinction between Asperger's Syndrome and autism concerns cognitive ability. While some individuals with autism experience mental retardation, by definition a person with Asperger's cannot possess a "clinically significant" cognitive delay, and most possess average to above-average intelligence. Fans of Charles LeBlanc's blog site "Charles LeBlanc Political ADHD Activist" have been surprised to see a blank white page where Charles' blog used to be located. Blogger has been having problems for the past 24 hours but Charles speculates that there may be more to it in the case of his blog site. Time will tell. In the meantime anyone wanting to see Charles' pics, and read what he and his guests have to say, can still do so at Charles LeBlancs Other Blog. and the media release translating it into ordinary language for us mortals which implicates the mother's immune system as a possible contributing factor in causing autism. Lead investigator Harvey Singer, M.D., director of pediatric neurology at John Hopkins Children's Center, stresses that autism is a complex condition caused by an interplay of immune, genetics and environmental factors. Further studies are needed to confirm that particular antibodies do indeed cross the placenta and cause damage to the fetal brain. (AScribe Newswire) -- The mothers of some autistic children may have made antibodies against their fetuses' brain tissue during pregnancy that crossed the placenta and caused changes that led to autism, suggests research led by Johns Hopkins Children's Center investigators and published in the February issue of the Journal of Neuroimmunology. The causes of autism, a disorder manifesting itself with a range of brain problems and marked by impaired social interactions, communication disorders and repetitive behaviors, remain unknown for an estimated 90 percent of children diagnosed with it. Genetic, metabolic and environmental factors have been implicated in various studies of autism, a disorder affecting 1 in 150 U.S. children, according to estimates by the Centers for Disease Control and Prevention. "Now our research suggests that the mother's immune system may be yet another factor or a trigger in those already predisposed," says lead investigator Harvey Singer, M.D., director of pediatric neurology at Hopkins Children's. Researchers caution that the findings needn't be cause for alarm, but should be viewed instead as a step forward in untangling the complex nature of autism. Mostly anecdotal past evidence of immune system involvement has emerged from unusual antibody levels in some autistic children and from postmortem brain tissue studies showing immune abnormalities in areas of the brain. Antibodies are proteins the body makes in response to viruses and bacteria or sometimes mistakenly against its own tissues. Yet, the majority of children with autism have no clinical evidence of autoimmune diseases, which prompted researchers to wonder whether the antibodies transferred from mother to child during pregnancy could interfere with the fetal brain directly. To test their hypothesis, the research team used a technique called immunoblotting (or Western blot technology), in which antibodies derived from blood samples are exposed to adult and fetal brain tissue to check whether the antibodies recognize and react against specific brain proteins. Comparing the antibody-brain interaction in samples obtained from 100 mothers of autistic children and 100 mothers of children without autism, researchers found either stronger reactivity or more areas of reactivity between antibodies and brain proteins in about 40 percent of the samples obtained from the mothers of autistic children. Further, the presence of maternal antibodies was associated with so-called developmental regression in children, increasingly immature behaviors that are a hallmark of autism. While the findings suggest an association between autism and the presence of fetal brain antibodies, the investigators say further studies are needed to confirm that particular antibodies do indeed cross the placenta and cause damage to the fetal brain. "The mere fact that a pregnant woman has antibodies against the fetal brain doesn't mean she will have an autistic child," Singer says. "Autism is a complex condition and one that is likely caused by the interplay of immune, genetic and environmental factors." Researchers are also studying the effect of maternal antibodies in pregnant mice. Preliminary results show that the offspring of mice injected with brain antibodies exhibit developmental and social behaviors consistent with autism. Senior author on the study: Andrew W. Zimmerman, M.D., of the Center for Autism and Related Disorders at the Kennedy Krieger Institute. Co-authors: Christina Morris and Colin Gause, both of Hopkins; Pam Gillin of the Kennedy Krieger Institute; and Stephen Crawford, Ph.D., Johns Hopkins Bloomberg School of Public Health. The study was funded by the Alliance for Autism Research. "If we had done what so many people told us to do years ago, we wouldn't have the child we have today. We would have written her off. Then what would she be today? We never would have seen she could write these things. Can you imagine? We would have never have gotten out of her how articulate she is how intelligent she is. Now, she tells us stories, she teases her brother. She just does it in a different way, she does it with her computer." ""The only effective treatment for autism is applied behavioural analysis and very intensive, and because it's costly the schools have avoided it"
It seems that, no matter the jurisdiction, professional "educators" simply will not acknowledge that many autistic children need Applied Behavior Analysis to learn and develop. I would not be surprised if the Tasmanian "educators" trot out the old "one side does not fit all" cliché to justify their failure. In Scotland Lacks Autism Services I commented on an article on healthcarerepublic on July 6, 2007 and the lack of services for people with autism in Scotland. That article, Call to find autism early in Scotland, focused on guidelines published by the Scottish Intercollegiate Guidelines Network (SIGN) calling on doctors to look for signs of autism in children and adolescents, including problems with social interaction and play, speech and behaviours. The article also expressed the doubt of many professionals in Scotland that early diagnosis would make much difference because of the lack of autism services available in Scotland. "Issues in the report include limited access to diagnosis, with 56% of those surveyed saying they found it hard to get their condition recognised. One adult said: "The GP did nothing. She didn't see any point in diagnosis for an adult." But even after diagnosis many say they do not get the support they need. One participant in the survey commented: "I have had little or no support ever - my mother has done everything." Bill Welsh, president of the Edinburgh-based Autism Treatment Trust, said the plight of many adults with autism had been "swept under the carpet", yet one child in 100 in the UK was diagnosed with the condition and the cost to society for each autistic child was estimated at £4 million. He added: "A major social, health and financial problem is upon us and urgent action is required." Senator Jim Munson is continuing his campaign for a National Autism Strategy. Senator Munson has been unrelenting in his efforts to help a constituency that Prime Minister Harper and Alleged Health Minister Tony Clement ignore - Canadians with autism. Speaking recently on Prince Edward Island Senator Munson stated that he would like to see the federal government take the lead in developing a National Autism Strategy to end the current patchwork of provincial programs"
The reality of autism is much more than heart warming feel good stories. The reality of autism is not a culture, or a life style choice, for many severely affected persons with autism and their families. The news is often filled with such stories of autistic persons, children and adults, who wander off, and get lost, unable to look out for their own safety and well being. Sometimes such stories have happy conclusions. Other times ... they do not. I have commented in the past of a terrifying personal experience when my son left our home while I was talking on the phone. In the Chicago area TWO autistic men wandered off, went missing, in the last week alone. In Family searches for missing man abc7chicago reports on 21 year old Jamaris Collins, who has the mental capacity of a young child, who had not returned several days after telling his aunt he was going for a walk to a nearby store. In Autistic man missing in Lyons the Chicago Tribune reported on John Valle, a 21 year old autistic man, who had no money, did not know his way around the Chicago area, cannot read or write and does not speak very often, who wandered away from his apartment in a Chicago suburb. Hopefully, John Valle and Jamaris Collins will be found, or turn up, safe and sound. Residents of Alberta head to the polls on March 3 2008 to elect a new provincial government. The Autism Society of Alberta and FEAT (Famlies For Effective Autism Treatments) of Alberta are both urging Albertans to Vote 4 Autism on March 3! The Autism Society of Alberta has prepared an Election Paper list of autism questions for the candidates. Vote 4 Autism on March 3! Immediately following is the press release from the Learning and Developmental Disabilities Initiative about the Scientific Consensus Statement on Environmental Factors in the development of neurodevelopmental disorders including autism spectrum disorders. Here are the links for the complete LDDI Scientific Consensus Statement and the executive summary. February 20, 2008, Seattle, WA. The Collaborative on Health and the Environment’s Learning and Developmental Disabilities Initiative published today the Scientific Consensus Statement on Environmental Agents Associated with Neurodevelopmental Disorders (available at http://www.iceh.org/LDDI.html). This statement, signed by more than 50 scientists and health professionals nationally and internationally, summarizes the latest science about environmental contaminants associated with neurodevelopmental disorders, such as learning disabilities, autism spectrum disorder, attention deficit hyperactivity disorder (ADHD), intellectual disabilities and developmental delays. “We know enough now to move on with taking steps to protect our children. This document pulls that knowledge together to further this vital effort," said reviewer Martha Herbert, PhD, MD, an assistant professor of neurology at Harvard Medical School and a pediatric neurologist with subspecialty certification in neurodevelopmental disabilities at the Massachusetts General Hospital in Boston. This document is designed for researchers, health professionals, health-affected groups, environmental health and justice organizations, policymakers and journalists to use as a resource for understanding and addressing concerns about links between environmental factors and neurodevelopmental disorders. Conor Is 12 Today. Happy Birthday Buddy! Conor turned 12 today. Happy Birthday Buddy! Below Conor enjoys his cake and relaxes with Mom. In Girl's writings opening new window on autism CTV tells the story of 13 year old Carly, diagnosed with autism at an early age and non verbal, who can now communicate very well with a computer. Carly surprised her family and therapists when she began typing words and then sentences. Carly was believed to be intellectually challenged. She is able to describe the frustrations she endures because of being different, in some ways, then other children, and because of her inability to express herself verbally. At the same time she describes very ordinary feelings for a child, including having "crushes" and describing "yucky" siblings. The CTV article states that Carly's development of computer assisted communication abilities challenges conventional views of autism. That may be so, at least for some children with autism disorders. But Carly's story also challenges the anti-ABA, anti-treatment, ideology advocated by some prominent "autistics" and espoused by their neurodiversity followers. And challenges their rhetoric that all persons with autism want to remain autistic. Carly's parents refused to "write her off" and instead obtained intensive ABA (Applied Behavior Analysis) intervention for her. Professionals, including autism specialist Dr. Wendy Roberts, who has read some of her writings and observed Carly on video, says that she is "certainly unique in her abilities and provides some fascinating insights into the condition of autism". Dr. Roberts also notes that "Carly possesses unique abilities that make her a rare case, or it may be that her early and intensive training simply drew the skills out." Her parents are very happy that they provided Carly with the benefits of ABA therapy. CTV has also provided a separate page of Carly's writings which are fascinating reading. Some of what she says strikes me in many ways as similar to what I imagine my son Conor is feeling. I found her writings on stimming particularly interesting. Fianna Fáil's Peter Power appealed to the Opposition not to assume that those opposing the motion were 'anti-children', saying nobody was absolutely right, or absolutely wrong. There was derisive laughter from the gallery when Fianna Fáil's Margaret Conlon, a former teacher, referred to children with special needs demonstrating their abilities 'when they play their tin whistles as a group'. Concluding the debate for the Government, Minister Micheál Martin said the Government did not believe 'one size fits all', because autism is a continuum, and said the idea of a wide range of teaching methods was not a ridiculous suggestion. These rationalizations were trotted out a decade ago in New Brunswick and other jurisdictions in Canada and the United States in an effort to deny proven effective ABA services for autistic children desperately in need of such help. These rationalizations are used to provide cover for a refusal to provide effective help for autistic children, not because of genuine concern that other methods might be more appropriate, but because of the cost implications of providing effective ABA intervention. The reality is that stubborn insistence on refusing the only widely endorsed, evidence based, effective intervention for autistic children is motivated by nothing more than miserliness. The concern of those who resort to such obviously weak excuses has nothing to do with ensuring that each autistic child receives the best intervention possible for that child. If it were they would provide ABA for each child for whom, in their wisdom, they consider it appropriate and other interventions, whatever they might be, for the others. But they won't do that either; governing parties are often just too cheap to spend money to provide evidence based, effective ABA treatment and education for autistic children. In New Brunswick the government of the day tried the old "one size does not fit all" approach . The debate over whether ABA should be provided by government was intense and at times very personal. But today, although improvements are badly needed, government funded ABA intervention is provided for pre schoolers and some methods and resource teachers and teacher aides are being trained to provide ABA in the school setting. My son with Autism Disorder , and in grade 6, receives ABA instruction every day at Nashwaaksis Middle School. ABA services are also provided to one extent or another in jurisdictions across Canada. The debate in New Brunswick, and elsewhere, was moved forward by focusing on the principle that interventions should have a solid evidence basis to support their effectiveness. Without an evidence basis parents and officials are essentially gambling with the development of autistic children by wasting time on unproven and unreliable interventions. Here in New Brunswick it was the insistence on evidence based interventions that emerged from an Inter Departmental Committee review of autism specific services in 2001, which at that time were virtually non existent. It is that commitment to evidence based practices which has led to substantial improvements, and to the provision of ABA services for autistic children in New Brunswick. Auditory Integration Training, The Miller Method, Sensory Integration, and TEACCH. The MADSEC depiction of ABA as the only autism intervention substantiated as effective, based on the scope and quality of research in support, was not the only review of the research literature to reach such a conclusion. State agencies in New York and California and the office of the US Surgeon General had reached similar conclusions. Nor was it the last. Other interventions were evaluated by the AAP but no other intervention received a comparative positive assessment, not even close. Fianna Fail is using the old beaten argument that one size does not fit all to justify refusal to provide ABA services to autistic children. In doing so they are denying those children the opportunity to realize, in the words of the AAP, "substantial, sustained gains in IQ, language, academic performance, and adaptive behavior as well as some measures of social behavior". Fianna Fail has its counterpart here in Canada. Although most provincial jurisdictions try to provide ABA services, the level of funding, and extent of service provided, varies from province to province. Our federal government has huge surpluses but will not provide funding to the provinces to pay for more ABA intervention. The Conservative government of Prime Minister Stephen Harper and Alleged Health Minister Tony Clement refuse, on a variety of flimsy grounds, including the old "one size does not fit all cliché", to spend money to help autistic children. For Ireland's Fianna Fail, and for Canada's Conservative Party, it appears that money means more than children .... more than autistic children anyway. "documents a research finding that has been said to show there is "no connection between mercury and autism" was wrong; thus, some may have written off any connection too hastily. Certainly, if persons concluded that mercury and autism could not be linked based on Ip 2004 stated results, they would want to reconsider." 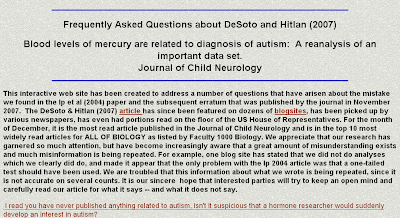 If you have a non-faith based interest in this important autism issue, and your source of understanding of the DeSoto and Hitlan article is Autism Street, or other blog sites, you may want to visit the DeSoto and Hitlan updated FAQ site. The authors ask people to communicate with them directly if they have questions about their article and the conclusions they reached on this important subject. PR Newswire announces that The Sundance Channel will be airing the Autism Every Day video on World Autism Day, April 2. The neurodiversity movement, always angry at those who disagree with its "autism is beautiful" philosophy, has an irrational hostility toward the Autism Every Day video and its creator Lauren Thierry. But many parents of autistic children, including me, appreciate the video's honest portrayal of the challenges presented by autism disorders and the impact on the lives of the children with the disorder and the parents who love them and care for them. Lauren Thierry, Autism Speaks, Robert Redford and the Sundance organization deserve applause for presenting the hard realities of autism to the world. NEW YORK, Feb. 13 /PRNewswire/ -- Sundance Channel will present the U.S. television premiere of Lauren Thierry's documentary Autism Every Day on April 2, 2008, which has been designated World Autism Awareness Day by the United Nations. The film, which debuted at the 2007 Sundance Film Festival, documents a typical 24-hour day in the lives of eight families struggling to raise children with autism. 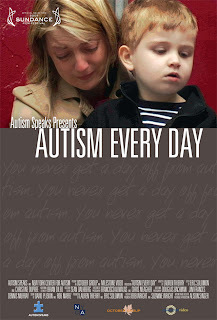 Autism Every Day premieres on April 2nd at 8:00pm et/pt. Autism is a complex brain disorder that inhibits a person's ability to communicate and develop social relationships, and is often accompanied by extreme behavioral challenges. There is no cure for autism and the symptoms can range from quite mild to very severe. Autism rates are increasing throughout the world. In the United States, diagnoses have increased tenfold in the last decade, affecting 1 in 150 children according to the Centers for Disease Control. Autism's cause remains unknown, and there is currently no test to help prevent it. Addressing the disorder as a global health issue, the General Assembly of the United Nations has designated April 2nd as World Autism Awareness Day in perpetuity, starting in 2008. On April 2nd, U.N. member nations will seek to raise society's awareness of autism through education and celebration. With Autism Every Day, director Lauren Thierry (who is herself the mother of a child with autism) illuminates the struggles parents of children with autism face every moment of the day. Thierry goes inside the homes of eight diverse families doing their best to cope with a perplexing disorder that completely dominates their lives. Autism Every Day shows how developmental skills that most parents take for granted -- a child's ability to brush his teeth or communicate a need -- can prove enormous hurdles for an autistic child. At the same, Thierry's film captures the unconditional, powerful love these parents feel for their children and their determination to provide them with the best care possible. Autism Every Day was produced by Autism Speaks, the nation's largest advocacy organization. Autism Speaks is dedicated to increasing awareness of autism spectrum disorders, to funding research into the causes, prevention and treatments for autism, and to advocating for the needs of individuals with autism and their families. It was founded in February 2005 by Suzanne and Bob Wright, the grandparents of a child with autism. Bob Wright is Vice Chairman, General Electric, and served as chief executive officer of NBC for more than twenty years. To learn more about Autism Speaks, please visit http://www.autismspeaks.org/. Under the creative direction of Robert Redford, Sundance Channel is the television destination for independent-minded viewers seeking something different. Bold, uncompromising and irreverent, Sundance Channel offers audiences a diverse and engaging selection of films, documentaries, and original programs, all unedited and commercial free. Launched in 1996, Sundance Channel is a venture of NBC Universal, Showtime Networks Inc. and Robert Redford. Sundance Channel operates independently of the non-profit Sundance Institute and the Sundance Film Festival, but shares the overall Sundance mission of encouraging artistic freedom of expression. Sundance Channel's website address is http://www.sundancechannel.com/. Let no child be left behind. National Autism Strategy? CBC has provided a good general overview of Autism Disorders in Canada in Autism Making sense of a confusing world. The overview includes a description of autism disorders, some autism history (Kanner and Asperger) and treatment. There is a good review of the funding and age restrictions for ABA services for autism in each province in Canada. There is one important omission and that is with respect to New Brunswick. Here we have a 5 year age cut-off as stated. But New Brunswick has begun to provide ABA intervention in our schools. This has been done by training Teacher Aides and Resource Teachers at the University of New Brunswick - College of Extended Learning Autism Intervention Training Program in Fredericton. A couple of classes of the UNB-CEL AIT have graduated, another is about to, and the government of Premier Shawn Graham and Education Minister Kelly Lamrock have committed to provide another 3 years of training for TA's and Resource Teachers through UNB-CEL. The UNB-CEL Autism Intervention Training Program is a key part of this approach. The program was developed through the University of New Brunswick with input from the Autism Society New Brunswick. This program is critical to ensuring the quality and integrity of the ABA and other autism services provided in the schools. By training TA's and Resource Teachers the education system's existing human resource system is used to the maximum extent possible. Some Autism Support Workers and Clinical Supervisors have been recruited by the Education Department itself. These people have been trained through a parallel program offered by UNB-CEL so the transition into the Education system is relatively smooth. There is with any such development resistance. Some senior Education Department careerists have preferred to struggle against the UNB-CEL training in favor of "in-house" training combined with a commercial internet training program but, to date, they have not prevailed. The CUPE local representing Teacher Aides have also filed grievances on behalf of its members since not all current TA's meet the UNB qualifications for admission to the Autism Intervention Training Program. As a labour lawyer I understand the role of the Union in protecting ALL of its members interests but the long term interests of the greatest number of their members is best protected by providing the autism training to those members who qualify for admission. And I would expect that any labour arbitrator hearing these grievances would give the greatest weight to the best interests of the child principle in arbitrating these grievances - in these cases the best interests of children with autism disorders. Apart from the omission of autism services in New Brunswick's education system the CBC review is a balanced, comprehenseive and informative overview of autism disorders and autism services in Canada. The Belleville Intelligencer continued its excellent coverage of dedicated Autism Dad Stephan Marinoiu's winter Autism Trek to Ottawa reporting on his greeting in Ottawa by long time autism advocate Senator Jim Munson and his meeting with federal "Health" Minister Tony Clement. Mr. Marinoiu described the challenges faced in Ontario where ABA service did not become available for his son. Unfortunately, as reported by Mr Marinoiu and the Intelligencer, alleged Health Minister Clement merely passed the buck for autism services, but not the bucks, to the provinces. High School political science students in this country are aware that the primary constitutional responsibility for health care rests with the provinces. But our history also shows that the provinces and the federal government have cooperated to provide a national health care system. There is nothing to stop the federal government from spending some of those surplus dollars taken from all Canadians to help provincial governments fund needed autism services across Canada. So that all Canadians with autism receive the services they need. It is long past time that alleged "Health" Minister Clement put the Health back in his title and started acting like a Health Minister. To put it politely Minister Clement - do your job or step aside please. 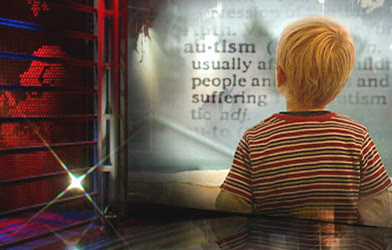 Autism Rising in California - Why?